A quarterly newsletter for Chapel Lawn and the Redlake Valley. Many thanks for your support to ensure that St Mary’s Church continues to flourish, and we look forward to seeing you at future fundraising and church events. * All films start at 7.30pm and cost £4.50 (children £3.50) Tickets are available on the door. Refreshments, including beer, wine, ice creams, popcorn and snacks are available at every film. A foot-stomping celebration of Queen, their music, and the fabulous, flamboyant Freddie Mercury. It traces the meteoric rise of the band through their iconic songs, their near-implosion and their triumphant reunion on the eve of Live Aid. 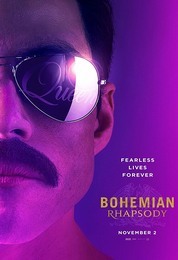 This film is an unadulterated joy for all Freddie Mercury and Queen fans. The film will be preceded by a delicious two course meal.